Heal thyself, harden thyself; change the world. My intention is for this to be a living, “work in progress” page. I’ll update this piece with new information as it becomes available, and as it influences me to adjust my working theory; my take on the subject of Physical Culture and Ancestral Wellness, my “life’s trajectory”, so to speak. My theories do not remain static, nor do I intend this page to remain so. As a consummate epistemocrat, I am forever on the prowl to uncover material that forces me to expand — or completely change, if need be — my most held-to beliefs. What follows are what I consider my to be my currently held “truths”, as they relate to overall well-being and the pursuit of Ancestral Wellness and the Physical Culture “high life”. Forget, and completely so, what you previously thought of as diet and fitness and overall well-being “Gospel”. Wipe the slate clean; be receptive to a completely new paradigm in nutritional well-being, Ancestral Wellness and Physical Culture. Wrap your mind around this one very simple idea: that agriculture is a relatively new development (within the last 10,000 to 50,000years, or so) vis-à-vis the human genome. Compare this relatively short span to the 4.5 million or so years that we have been, essentially, in our “current iteration” as humans. Our bodies (and by extension, our genotype) have not evolved sufficiently, and are therefore not adequately prepared to handle, the “modern” onslaught of grain (in all of grain’s multi-varied derivatives) and especially so that of other simple, highly-refined, carbohydrates. Our thinking may (arguably) be well-advanced from that of our stone-age ancestors, however, our bodies and brains, genetically speaking, are relatively identical to the Paleolithic, hunter-gatherer. There is more to the story, of course, when discussing this environmental mismatch we find ourselves in. However, this story line gives us the directional accuracy we need to make excellent health choices in the here-and-now. Performance is not a direct indicator of health. In fact, high level performance can (and often is) highly detrimental to overall health. Exercise (in the pursuit of health) should be infrequently intense, mostly of short duration, and highly variable. This periodic, high-intensity work should punctuate numerous periods of low intensity training and “play”. I like to call this, waving intensities and weaving modalities. Training for a specific athletic event/sport is an entirely different animal — and (and I can’t reiterate this enough) not necessarily a healthy one. In fact, to the extent that we correlate sporting prowess to overall health and well-being is indicative to just how off-base, irrelevant — and hurtful, even — mainstream ideas toward health, diet and fitness have become. It’s just another variant of the “Biggest Loser” fallacy. This process is an ever-undulating, ever-expanding journey; there is no static or defined “destination”, per se. “Good health” must always be measured in context, and against the background of one’s goals and one’s environment (more on that in a bit). Constant adjustment and refinement must be the rule of the day and not the exception, as new scientific findings must be continually evaluated and reevaluated in light of practical application. All things must be evaluated through prisms of an n=∞ and n=1 nature; that is to say, all “truths” carry with them a universal and an individual component. This blog, then, is more of a signpost along the path than it is “the answer”. Take from it what is useful in your own on-going journey, and make it your own. Remember that intense exercise is only as effective as one’s recovery allows. Work hard, recover harder, if you will. Proper supplementation is crucial; but it is just that — a supplement to an already dialed-in diet / lifestyle. “Supplement” does not imply “substitute”. Ancestral Wellness? I use the term “ancestral wellness” (you’ll see the term “Ancestral Momentum” as well) as a proxy to describe the all-encompassing epigenetic inputs that influence a healthy expression of our inherent genetic code. A roadmap, if you will, toward an optimized phenotypical expression of the human experience. In the simplest of terms, our current genetic code is the result of millions of years worth of fine-tuned evolution; a code that must now attempt to express itself in an environment (and with environmental input) that is anything but what it evolved to thrive in. The aim of ancestral wellness is not to attempt to reclaim some fanciful “lost paradise”, but to seize the best of what modern advances in technology have availed, while simultaneously avoiding modern environmental pitfalls. Mind-mapping the course to FREEDOM. I can only focus on one goal at any moment in time. Not that I might have many goals active in my life at any one point (I most certainly do), but that I can only focus on one right now. And any “sub-goal” I may have is in support of my ultimate goal (my North Star), which is FREEDOM. That said, I have to have systems in place (do you see the entrepreneur in me coming out, here?) that allow me to move toward my higher-level goals when I’m not actively focusing on them. My complete wellbeing (and mastery of the physical quality; see below) is supported by knowledge or action that fits nicely within one of the four pillar categories. If I have problems figuring out which category an item fits in, I need to think twice about it’s applicable value, at least in my physical life. Every goal I have has to be measured against six “qualities” that comprise the whole of ME at this point in time. I think of the goal as the destination, the six qualities as the navigation, and the four pillars as the mode of transport. So yes — I put my financial viability where my mouth (and mind and heart) is! I’m not just suggesting what you do, I am simply living by example. I’m not an expert on any of those six qualities, save for one: the physical aspect of our nature. As such, the Five Ts is my on-going, personal development plan for my physical nature. Time – how much are you willing and/or able to invest, per week? How much time per day/session? Tools – what equipment/facilities do you have available to you? A full-blown S&C facility, or simply nature’s playground? Temperament (tenacity, intensity) – for instance are you more wood, fire or water? In coaches/trainers, do you respond best to a drill sergeant or nurturer? Techniques – Oly lifts? Gymnastic moves? Can you pull-off a devastating set of JReps? Can you effectively prescribe and implement a French Contrast session? Can you effectively mix and match modalities, rep schemes and tempos according to your goals? Are you simply painting by numbers, or are you S&C’s version of Jack Pollock? Trade Mark (basecamp) – Ectomorph? Mesomorph? Endomorph? Ox, or gazelle? John Henry, or Jack Be Nimble? You’ll see each of these elements covered more fully throughout TTP (you can also sign up for the newsletter and get a free Five Ts e-book), but for now I’d just like you to become acquainted with them. Notice that these attributes vary in their “mutability”; in other words, one attribute (trademark, for instance) will remain relatively fixed over a lifetime, where another (tools, for instance) may shift wildly over the same period. But even those attributes that you might think of as being “fixed” have the potential to change over time. Not that one’s DNA just magically shifts, but that one’s perception of themselves and of their capabilities can change over time. Sometimes drastically so. I have seen trainees who’d previously considered themselves ectomorphs or “hardgainers” suddenly begin to put on substantial muscle once they got a firm handle on the other four Ts, reestablish realistic goals, and optimize their diet, lifestyle, supplementation and exercise prescription. In other words, they focused on an appropriate goal, and squared-away the four pillars of Physical Culture. This, then, set the table for an effective and efficient navigation (via the Five Ts) toward that goal. It’s a hackneyed cliche, but also very true: perception is reality. Change your perception, and you can drastically change your reality and, therefore, your outcome. Trademark and Temperament may not be as fixed as you previously thought. And remember: it’s rarely the “one thing” that triggers a dramatic shift in potential outcome, but rather a culmination of many small things done with consistency. Ultimately, the Five Ts is a method by which one can maintain a culture of consistent improvement through optimization, relative to one’s circumstance. This may be a tough pill to swallow in today’s age of quick fixes. It is, however, a key component of real, and lasting, habit change. In my own case, those periods of extended military deployment stymied any progress in absolute strength I may have gained if I’d remained stateside and with access to a full-on S&C facility. My simply not having access to the proper tools (in this case, heavy barbells, etc.) directly and negatively affected my ability to attack that quality. However, and in spite of some pretty abysmal conditions, I made some spectacular gains in bodyweight elements — bar work, ring work, floor work and the like — that then catapulted my absolute strength gains once I was back stateside and one more with access to heavy barbells and dumbbells. Though during deployment, my access to certain tools and available time was diminished, other options appeared. The Five Ts kept me on track, and in the game. Now, the last thing I want you to do is to get hung up in a purely manufactured, chicken-and-egg conundrum. Which came first, the goal, Four Pillars or the Six Qualities? In reality, it doesn’t matter where you start as long as three things are defined: (1) the destination, (2) the best route, given the circumstance and (3) mode of travel. That’s it. Sounds so simple, right? However, it’s precisely the “that’s it” part that ultimately hamstrings most trainees. Numerous dissertations could (and have) been written on the psychology of successful goal setting, but here’s the most prevalent take-away: small and incrementally attainable vs global and overarching. So it doesn’t matter if your ultimate destination is 100 lbs of total fat loss, or adding 100 lbs to your squat PR, the idea is the same: small, incremental victories on the way to winning the war. In other words, attack each 5 lbs in the weight loss journey; attack each 5 lb increase in the squat. Because the thing is this: each of those 5 lb chunks may require a re-evaluation of your Five Ts and/or a tightening-up of your Four Pillars. Biting off too big a chunk will ultimately derail you and, in the process, totally discourage you from attaining your ultimate goal. So the take-away is this: small, attainable, consistent steps. Reevaluate your Five Ts. Wash, rinse, repeat. It’s that easy. But remember: all of this is for nada if you don’t have a clearly defined “why” to act as your north star. And don’t worry is that why seems to elude you. Hell, it’s taken me the better part of 51 years to define mine. However, once you do define your why, the entire universe will work with you to see that it manifests. What’s my why? Simply stated, it’s to unlock the vast human potential that is imprisoned in poor health. All else for me flows from that one simple thought. Every journey begins with a first step; the TTP journey begins here. And what the hell? We might as well include the second step, too. The basic concept of a Paleo-like diet is that our bodies are genetically best adapted to utilize the foods we evolved to eat, and that humans (and ergo, the human genome) evolved over a few million years as hunter-gatherers. Agriculture did not appear on the human landscape until between ten to fifty-thousand years ago. Although most reliable estimates place the appearance of agriculture at closer to the ten thousand year mark, even using the maximum fifty-thousand year estimate yields a similar outcome — not nearly enough time for our genotype to evolve sufficiently to cope with the introduction of these new, agriculturally-grown (read, grain) foodstuffs. And especially so, highly refined carbohydrates. The most prevalent source of calories for our Paleolithic ancestors of 50,000 years ago would have been lean meat and (preferentially) internal organs. The fatty parts, when available, would have been favored (as it offered more caloric “bang for the buck”). As most wild game is (relatively) lean, though, the average fat intake would likely have been moderate for most cultures. Our genes are cued to respond favorably to a much higher fat intakes, however. Dairy, too, would not have been consumed until just a few hundred generations ago, when livestock was initially domesticated. Lactose intolerance is an extreme symptom of our genotype’s having not yet evolved to handle this novel food. Lactose tolerance, however, is a good example of “rapid evolution” in our species and an argument for considering the risk/reward ratio of all foods before making choices about whether to include that food in one’s diet. I take an agnostic approach when it comes to dairy, as many people (myself included) do tolerate it well, and (in the raw / unpastuerized form at least) dairy does provides a multitude of healthful benefits. Wild animals of all sorts (including muscle tissue, fat, organs, brain and marrow). However, the total amount of fat, and the fatty-acid composition of that fat, was different than that found in modern domestic animals. It can be argued, as well, that the carbohydrate content and load for the modern version of the fruits/berries (and to some extent, vegetables, as well) is much different that that available to our ancestors. The same can be said for the nutrient density per calorie of these items as well (actually, the nutrient density of all foods have dwindled, but that’s another story for a later time). That fruit is the most modernly “altered” of foods we assume are “safe” is minor point of contention, though I do tend to agree. One can, however, avoid problems here by simply limiting the ingestion of these foods. The same can be said for opting to eat grass-fed meat when possible and where available. I am a realist, though, and will always opt for taking care of the major worries before attempting to fix the minor stuff. See my thoughts on the 80/20 rule, here. I think if one approaches diet with the aims of (1) keeping insulin levels consistently low and (2) controlling satiety, then all else will take care of itself. the individual components of the workout — as well as the workout itself, when considered in total — should be constantly variable. workout intensity and workout frequency should act as inverse variables. above all, try to learn to listen to the fractal rhythms of your body and adjust the four prior-mentioned points accordingly. there should be periods of low-intensity “play” interspersed throughout the more intense exercise outings. This can consist of virtually anything you enjoy that involves fresh air and bodily movement. Walking, for example. Light tennis. Softball. Personally, I enjoy fixed-speed and mountain biking. Partake in whatever lifts your spirit and fuels your fire. Waving intensities, weaving modalities should be the overriding dictate. So there you have it, Theory to Practice in a nutshell. I am, at my very essence, that epistemocrat I spoke of in the opening paragraph. One as defined by Nassim Taleb (in his marvelous book, The Black Swan), as being “someone of epistemic humility, who holds his own knowledge in greatest suspicion” (hat tip to Brent Pottenger, at Healthcare Epistemocrat, for that fine quote, and for taking the lead of expanding this idea as it applies to expression of fine Physical Culture). As such, I consider myself a consummate seeker of knowledge, but one not married to any single notion. Dogma, to me, is an anathema. The only dogma is, that there is no dogma! 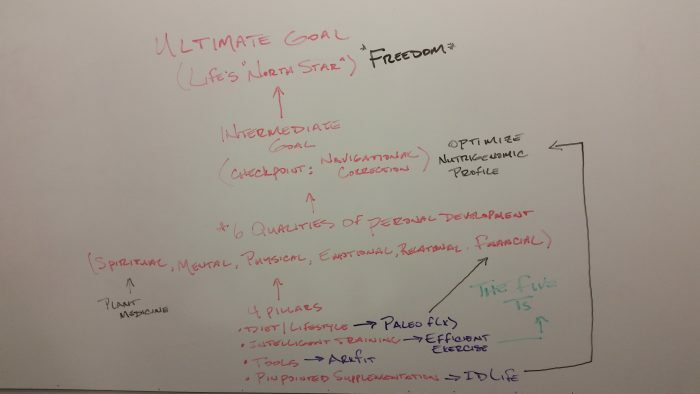 This blog, then, is a composite of my own n=1 journey through the wilderness in search of the best that might be obtained in the wide world of Physical Culture. That we are only now beginning to uncover and wrestle with the effects of poor diet and inadequate fitness upon our overall health is an indication of just how far we have to go, as a species, to live in proper alignment with our inherited genetic potential. And what an awesome potential it is! So pack your bags, grab your sextant, and come along for the ride of a lifetime.